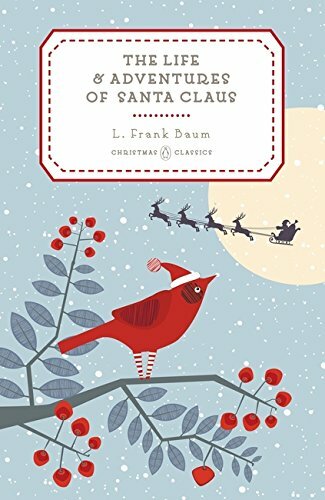 Late last month I was asked if I would like to review a copy of The Life and Adventures of Santa Claus and it was one of those moments when I couldn't say "YES!" fast enough. (It's rare I'll turn down a chance to read a fun Christmas story.) Penguin Classics recently reprinted this story by L. Frank Baum which was originally appeared on the scene in 1902. You'll note Baum's name, of course, as being the author of The Wonderful Wizard of Oz which had been published two years prior. I read Oz back in 2009 (linked to my review which I personally find to be poorly written) and thought it was weird. Honestly, I wasn't sure that I would enjoy a Baum Christmas tale if it was told in the same style as Oz but the fact that the theme was Christmas convinced me to take the plunge, regardless. I am tremendously glad to have "taken a chance" on The Life and Adventures of Santa Claus . It was an absolute fantastic, magical tale and one which I would suggest is not to be missed in your Christmas reading. 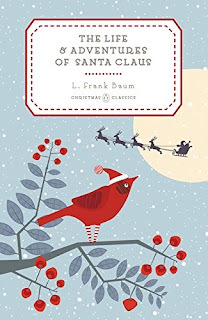 Unlike in Oz, Baum has a rhyme and rhythm in writing about Claus. It passes off as more of a fairy tale than anything else. The basic plot is that a mortal babe is found in the woods near the immortals. The immortals are not to have anything to do with human mortals, but a nymph named Necile asks to be allowed to take charge of the human infant and raise him. She is granted permission to do so and, as you might guess, she names the child Claus. Claus spends his growing up years in the fellowship and community of the immortals. When he is full grown he is introduced to the world of men and he finds himself needing to make his way among them. He settles in a place called Laughing Valley where he builds his home and new life among men. This book is divided up into life sections of Claus, describing first his childhood then his adulthood, concluding with the explanation of how it was that he ultimately became immortal himself. Along his journey we see how he came to begin crafting toys for children, how and when he began using reindeer, as well as the evolution of the chimney and stocking traditions. It's all cleverly told in an engaging manner which kept me spell-bound from the first to the last page. I didn't grow up believing in Santa Claus but always thought he was a rather fun character. My children understand that though he is not real, he is based on a real person and that person was worth admiring. We like reading stories about this jolly, giving soul and The Life and Adventures of Santa Claus foot the bill when it came to a relaxing, enjoyable Christmas read. As soon as I was done with it, I passed it along to my oldest (age 9) who read it in two days and said he enjoyed it also. This is a title that I'll be sliding up on my shelf to re-read in Christmas seasons to come. If you have a chance to look it up, DO! It's just plain, jolly fun. Many thanks to Penguin Classics who sent a copy of the above title my direction in order to facilitate this review. I received no additional compensation and all opinions are 100% my very own. I haven't heard of this! Sure looks worth checking out! Interesting! I hadn't heard of this one, either, but one of the Santa Claus cartoon shows tells a little of his "history" - about being a foundling on a doorstep. I can't remember which one. I read your review on The Wonderful Wizard of Oz. I have also read the biography, but it was many years ago, and I've read TWWOO as well as one or two of the sequels. I thought it was interesting to get more of the adventure, more strange lands and characters. I will always love the Judy Garland movie. I saw the TV special The Wiz the other night; it was different, very well done, but no replacement.